Ophthalmology Research, Cedars-Sinai Medical Center, Principal Investigator, National Eye Institute (NEI) keratoconus research grant, entitled ‘Genetic Factors in Keratoconus'. This research grant on keratoconus, the largest grant of it's type in the world on keratoconus has been funded from 1993 to 2013. Click below to hear a patient’s experience about collagen cross linking. A new treatment to halt the progression of keratoconus. Click here to view a videoclip of INTACS with Intralase for keratoconus, the very latest treatment for keratoconus patients who have clear corneas, but are contact lens intolerant. "Many patients with keratoconus feel their treatment options are limited, this is not correct. Two new treatments for keratoconus are INTACS with the Intralase and Corneal Transplants with the laser (I.E.K.) both provide a safe and effective means to obtain excellent vision in keratoconus patients who can no longer tolerate their contact lenses"
The Keratoconus Center is one of the few centers in the world dedicated to both research and treatment of keratoconus. Under the direction of Yaron S. Rabinowitz M.D., expert on keratoconus and cornea specialist, The Keratoconus Center offers consultation for the medical and surgical treatment of keratoconus. In addition, patients may volunteer to participate in a variety of clinical trials to treat and elucidate the underlying causes of keratoconus. To schedule a consultation, discuss surgical options, or participate in a clinical trial please call 310-248-7474 to schedule an appointment. Because the cornea is irregular and cone shaped, glasses do not adequately correct the vision in patients with keratoconus since they cannot conform to the shape of the eye. Patients with keratoconus see best with rigid contact lenses since these lenses provide a clear surface in front of the cornea allowing the light rays to be projected clearly to the retina. Hence the vast majority of patients are treated with rigid contact lenses. There are however some excellent new surgical options for patients with keratoconus who cannot tolerate these lenses, these options are discussed under treatments for keratoconus. Many patients are initially unaware they have keratoconus and see their eye doctor because of increasing spectacle blur or progressive changes in their prescription. In many instances even a good refraction yields poor vision. Keratoconus is most often diagnosed by a cornea specialist who may see typical findings when examining the patient at the slit-lamp. In early forms of the disease there may be no obvious finding on slit-lamp evaluation and the diagnosis is made by computerized videokeratography only. Keratoconus typically commences at puberty and progresses to the mid thirties at which time progression slows and often stops. Between age 12 and 35 it can arrest or progress at any time and there is now way to predict how fast it will progress or if it will progress at all. In general young patients with advanced disease are more likely to progress to the point where they may ultimately require some form of surgical intervention. Keratoconus may occur in one eye only initially but most commonly affects both eyes with one eye being more severely affected than the other. Both males and females are equally affected and there is no ethnic predilection though in some parts of the world such as New Zealand and in certain parts of Finland there is a higher incidence due to genetic factors. Despite millions of dollars being spent on keratoconus no one truly knows the cause of the disease. There have been many interesting theories but none of them have been proven conclusively neither have any of them consistently been reproduced by multiple research groups. For example one theory suggests that there is deficient collagen crosslinking caused by free radicals but there is no scientific reproducible evidence to support such a theory. Others suggest that eye rubbing causes the progression of keratoconus. The evidence for this is however anecdotal based on several case reports, but again there is no reproducible scientific evidence to support this. Our research group was the first group to demonstrate that genetic factors play a major role in the development of keratoconus. While our scientific based evidence supports a role for genetic factors this does not mean if your children will necessarily develop keratoconus, since only 13-15% of keratoconus patients have a family history with keratoconus. It does mean however that genes play a role in its development and understanding their role in the development of keratoconus may one day lead to a permanent cure. Yaron S. Rabinowitz M.D. is a corneal surgeon and expert in the treatment and diagnosis of keratoconus. He has published more articles on the diagnosis and treatment of keratoconus than any other practicing eye surgeon in the world. He is Clinical Professor of Ophthalmology at U.C.L.A. School of Medicine and the Director of Eye Research at Cedars-Sinai Medical Center. His research on the early detection and genetics of keratoconus has received funding from the National Eye Institutes of Health and for the past 15 years. The first to describe that mild topographic abnormalities occur in family members of patients with keratoconus. Authored one of the first text books on corneal topography. The first to demonstrate through a research study that keratoconus has a genetic basis. The first to demonstrate which keratoconus suspect patterns progress to ultimately develop keratoconus. Most recently published the first article which demonstrates that the femtosecond laser is accurate and preferable for creating channels to insert INTACS a novel new treatment for patients with keratoconus. The American Academy of Ophthalmology Honor Award. The Jules Stein/UCLA Research Alumni Award. The 3rd American to be the honored guest of the French Eye Society. 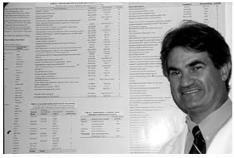 The recipient of the International Society of Refractive Surgery and the American Academy of Ophthalmology– Kritzinger Memorial Research Award for contributions to refractive surgery research. Dr. Rabinowitz sees patients in consultation at his Beverly Hills office and performs surgery on patients with keratoconus at the Eye Surgery Center Beverly Hills. To contact Dr. Rabinowitz or to schedule an appointment call our office at 310-248-7474. The Keratoconus Genetics Research Program at Cedars-Sinai Medical Center is the largest research program on Keratoconus of its kind in the world. It has been funded by the National Eye Institutes of Health for the past 15 years and recently the Principal Investigator Yaron S. Rabinowitz M.D. was awarded a 3.5 million dollar grant from the National Eye Institutes to continue this research until 2013. The goal of the research project is to identify genes contributing to the development of Keratoconus and using this information to ultimately to devise a cure by for this disease by means of gene therapy. We will supply your eye doctor with a computerized map of your cornea so as to facilitate obtaining a far better fit for your contact lenses. We will monitor the status and/or progression of your Keratoconus, on an annual basis. We may be able to identify which of your family members (if any) are at risk for developing Keratoconus. To schedule an appointment, please contact our research coordinator Martha Bucaram at (310) 248-7471. or email her at bucaramm@cshs.org. During your visit, which should take about 30 to 60 minutes, you will be asked to complete a questionnaire. An eye exam will be performed and computerized photos of your corneas will be taken. We may also request a blood sample from you which is optional and is not a requirement for participation in this study. You will be given a complete evaluation by a cornea specialist and an expert in Keratoconus. Convenient validated parking is available at our Beverly Hills office. We can arrange for your to meet other patients with keratoconus who have had many contact lens changes or corneal transplants, so that you can discuss problems of common interest, share information, and better understand the treatment options that are available. The early treatment of keratoconus with INTACS and the Intralase laser. Identifying genes in families with keratoconus. PRK (photorefractive keratectomy) for keratoconus. Treatment of mild to moderate keratoconus with INTACS and the Intralase laser. Treatment of keratoconus with the Visian ICL. Lamellar transplants in the treatment of keratoconus. Developing a molecular genetic test to diagnose keratoconus. Videokeratography indices for detecting early keratoconus. Developed a computer software to early detect keratoconus. Identified the first molecular defect in keratoconus. The first group to demonstrate keratoconus has a genetic basis. The first group to publish and demonstrate that inserting INTACS with the Intralase laser is safer and more accurate than the mechanical technique. The first group in Los Angeles to offer the Intralase laser for corneal transplants in patients with keratoconus. To participate in our clinical trials please contact our research coordinator Martha Bucaram at 310-248-7471 or bucaramm@cshs.org. This is part of an ongoing study supported by the National Eye Institutes of Health over the past 15 years. In this study all patients with keratoconus and their family members under videokeratography (detailed topographic pictures of their cornea) and family pedigrees and data are entered into a database. Blood is also drawn from family members for molecular storage and molecular genetic analysis. We hope one day to identify a gene for keratoconus and find a means of retarding its progression early on in the disease. To date we have identified a gene locus on chromosome 5 in one large family with keratoconus (click here to view PDF of publication for details) and multiple other loci in sib pair analysis of keratoconus families. These loci may all contain genes providing clues to the underlying mechanism of the disease process in keratoconus. We are particularly interested in individuals who have a family history of keratoconus or at least one family member with keratoconus. All study related costs are free, however, if patients opt to have treatment, they will be charged a discount off normal costs. By examining corneal transplant buttons on patients upon whom we performed corneal transplants we detected a molecular defect in patients with keratoconus – the absence of a water protein – Aquaporin 5 (AQP5). We hope to develop this into a molecular genetic test for ‘early’ detection of keratoconus. This will be particularly useful in family members of patients with keratoconus and patients with suspicious topography labeled ‘keratoconus suspect’. We ask all our patients upon whom we perform corneal transplants to donate their diseased corneas for molecular genetic analysis. If we perform your transplant and you agree to donate your cornea you will be making a critical contribution toward increasing our knowledge and understanding of keratoconus. Our center is a large referral center for patients who are suspected for having keratoconus with either suspicious topography or clinical signs. We see approximately 20 such consults each week. We have developed computerized software with indices, which are critical in helping us make a decision as to whether it is safe to recommend patients proceed with laser refractive surgery. Development of this software has been dependant on developing a large database of normal patients and patients with suspected ‘early’ disease’ and following such patients longitudinally over time. Data from all patients who visit us for referral are entered into databases for ongoing evaluation and refinement of these indices. If you are interested in participating in our clinical trials please contact our research coordinator Martha Bucaram at 310-248-7471 or bucaramm@cshs.org. Patients with very mild disease may initially be corrected with glasses or soft contact lenses, however the vast majority of patients need rigid contact lenses for adequate vision correction. There are a variety of types of specialized rigid contact lenses and depending on the contact lens fitters experience or expertise they will describe the one best suited for you. The very latest contact lens for treating keratoconus is the “synergize hybrid contact lens” which is rigid in the middle and soft on the edges. This has the potential to give you the good quality vision of the rigid lens with some of the comforts of the soft lens. We don’t fit contact lenses, but we do work with several excellent optometrists who specialize in fitting lenses for keratoconus in the Los Angeles area and would be happy to refer you to one should you so desire. It is always a good idea to try several different contact lenses and fitters before giving up on them and embarking on surgery. Many patients find their contact lenses uncomfortable and can only tolerate their contact lenses for a short period of time. The reason this happens is that the cornea steepens and rubs against the lens causing an abrasion and light sensitivity . Another reason is patients with keratoconus often have very dry eye and as the eye dries out there is no lubricating barrier between the lens and the cornea contributing to the patient being uncomfortable. There are now many ways to treat dry eyes to improve contact lens tolerance. This includes the use of artificial tears, treating the lids for lid disease, Restasis– for increasing tear production and the use of punctal plugs to prevent tears from draining down your nasolacrimal ducts and keeping the eye moist. Sometimes a little scar or nebulous appears on the tip of the cornea that constantly rubs against the lens making it difficult to tolerate contact lenses, this scar can be removed with a blade or with the Excimer laser to return patients to contact lens tolerance – this procedure is called phototherapeutic keratectomy(PTK) or nebulectomy. A method for flattening the cornea that is too steep and making a patient more contact lens tolerant is the insertion of INTACS into the cornea. This procedure is good for patients who are contact lens intolerant and who want to avoid a corneal transplant and whose K readings are not in excess of 58 Diopters. It is also useful for individuals with keratoconus who want to improve their present vision with or without contact lenses. This technique involves the insertion of two arc like plastic segments into the middle of the cornea to flatten the cornea. This procedure was pioneered 8 years ago in France, and is routinely being done by many cornea specialists in the United States. It is FDA approved under an HDE protocol and many insurances cover all or part of the cost. Our center pioneered the use of the Intralase laser for making the channels to insert the plastic segments this makes it a much safer and simpler technique for the patient compared to the mechanical technique which involves using metal blades, our finding have been confirmed by several other large research groups. We have now done several hundred of these procedures with the Intralase with excellent results. In many instances we have had to remove INTACS that were too superficially placed elsewhere using the mechanical technique only to get an excellent result when it is inserted with the safer and more accurate Intralase technique. Click the links below to read about the very latest advances in keratoconus treatment. Inserts using femtosecond laser less traumatic, more accurate. COLLAGEN CROSSLINKING (CXL) – to stop the progression of Keratoconus. Click below to view an educational video about the procedure. The most promising technology for treating Keratoconus called collagen cross linking (CXL) with UVA is currently being introduced into the United States under experimental protocols in Clinical Trials. This treatment, which has been used in Europe for eight years, now is undergoing Phase 1 FDA clinical trials in the United States. It has been demonstrated to be safe and effective if performed, with the epithelium removed, and has the potential to stop the progression of Keratoconus. This treatment is recommended for individuals with progressive Keratoconus or Ectasia following LASIK to stabilize the cornea. It can be performed with our without INTACS. Even though enrollment for this procedure for the FDA trials is closed, our center is one of the only centers in the United States that has received and I.D.E. (Investigational Device Exemption) from the FDA to treat patients with this procedure and we are currently enrolling patients under an Investigational protocol. This protocol allows us to enroll patients for the next 5 years and can be viewed on the government website – www.clinicaltrials.gov. Since this treatment is still regarded as experimental in the United States it should only be done with Institutional Review Board (IRB) approval, so that patients can adequately be protected. The procedure, which is painless, is as follows. The top layer of the cornea is removed under local anesthesia. Vitamin drops are soaked into the cornea until they penetrate the entire corneal and evidence of penetration into the anterior chamber of the eye is demonstrated by slit-lamp evaluation. Once this is confirmed the patient’s eye is put under a specialized lamp, which emits UV light at a predetermined wavelength for approximately 30 minutes. During this process the cross links, which link the fibers of the cornea, are increased thereby stiffening the whole cornea. A bandage contact lens is then put on the eye and patients are given antibiotics and anti-inflammatory drops and follow up on a regular basis with their physicians for several months. Many patients notice an improvement in their vision at 3 to 6 months and European studies suggest that only 5-8% of patients need to be retreated. Click here for a review of the literature on this procedure read this recent article by Dr. Rabinowitz. IT IS VERY IMPORTANT THAT THIS TREATMENT BE DONE ONLY WITH THE EPITHELIUM REMOVED (EPI-“OFF”), this is the only methodology which has been tested in the laboratory and has been shown to be safe for treatment in humans. CLICK HERE TO FIND OUT OTHER REASONS WHY WE DON’T PERFORM OR RECOMMEND THE “EPI-ON” PROCEDUREthat is advocated only by a handful of doctors, the vast minority doing this procedure. The slide below which is an Electronmicograph of the cornea, which has undergone the procedure, clearly demonstrates that the epithelium acts as a barrier to cross-linking. 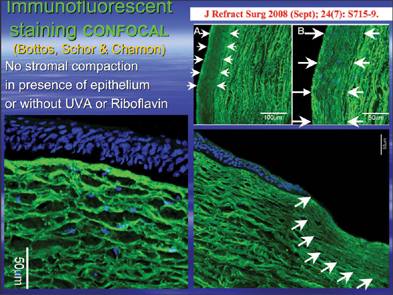 As you can see from this slide in the areas where the epithelium is missing, the stroma is compacted and cross-linking has occurred, while in the areas where there is epithelium (blue layer) the corneal fibers below are widely spaced and no cross linking or compaction has occurred (see slide below). "Cross-Linking for Keratoconus- Epi-On or Epi-Off"
We are pleased to announce that after studying this technology now for many years we are offering the only Clinical Trial in the United states under an FDA protocol approved by the Western Institutional Review Board (WIRB) which will determine whether it is more efficacious to combine INTACS with collagen cross linking or do cross linking alone to halt the progression of Keratoconus. To qualify for participation in this study you need to have a diagnosis of Keratoconus or Ectasia after LASIK. This study is not complementary nor are patients paid to participate in this study. There will be a fee for both the procedure and the tests involved in the pre-operative evaluation. For those who are interested in participating, please call 310-248-7474 and speak to Martha Bucaram the study coordinator or email Martha at Martha.Bucaram@cshs.org. Corneal Transplants are the only option for patients who have scarring in the center of the cornea or who are contact lens intolerant because their corneas are too steep. The results of corneal transplants are excellent in keratoconus patients with an over 97% success rate. Patients can have LASIK or PRK on their transplants and become relatively independent of glasses or contact lenses – many of our patients achieve 20/30 or better vision with this combination of procedures. Recently the Femtosecond Laser was approved for performing Corneal Transplants (also known as I.E.K or Intralase Enabled Keratoplasty). This is one of the biggest advances in Corneal Surgery in the past 30 years. The result is a quicker procedure, quicker recovery and less astigmatism with better vision. The Keratoconus Center is one of the few centers in the world that now uses this groundbreaking technology. Sometimes patients who have had a successful transplant with a clear cornea still do not see well and cannot tolerate contact lenses. The reason for this is that they have large amounts of astigmatism following their transplant surgery. This can be corrected with Astigmatic Keratotomy (AK) and followed if necessary by Excimer Laser PRK. In most instances patients then become either contact lens tolerant and can see better with glasses or contact lenses. DEEP LAMELLAR ANTERIOR KERATOPLASTY (DALK) AND I.E.K. Though eye care professionals recommend against Excimer laser PRK in patients with keratoconus because it thins the cornea even further, we are actively researching this area. Our experience has shown that in patients who are over age 40 whose vision is stable and whose corneas are thick enough they get similar results with the Excimer PRK as they would get with glasses. Patients who elect to undergo this treatment will be done under an experimental protocol and need to understand that they are at increased risk of scarring with the potential for needing a corneal transplant. Patients who are extremely nearsighted more than -10D might benefit from phakic intraocular lenses. Currently there are two type of these lenses approved by the FDA –the Verisyse and the Visian ICL. These are implantable contact lens has been approved by the FDA for up to -20Diopters. We are one of few centers performing a research study on the use of these intraocular lenses in keratoconus eyes, This will be an exciting new opportunity for a select number of patients with keratoconus who could potentially improve their vision without the need for laser surgery. All the procedures outlined above are routinely done by Dr. Rabinowitz himself who is a cornea specialist and an expert in the treatment of keratoconus. Ophthalmologists (medical eye doctors) perform over 40,000 corneal transplants each year in the United States. Of all transplant surgery done today, including hearts, lungs and kidneys, corneal transplants are by far the most common and successful. The cornea is the clear front of the eye that covers the colored iris and the round pupil. Light is focused while passing through the cornea so we can see. To stay clear the cornea must be healthy. Vision cannot be corrected satisfactorily. Painful swelling cannot be relieved by medications or special contact lenses. What Conditions May Require Corneal Transplants? Once you and your ophthalmologist decide you need a corneal transplant, your name is put on a list at the local eye bank. Usually the wait is short. Your ophthalmologist may request that you have a physical examination and other special tests. If you usually take medications, ask your ophthalmologist if you should continue them. Surgery is often done on an outpatient basis. You may be asked to skip breakfast, depending on the time of your surgery. Once you arrive for surgery, you will be given eye drops and sometimes medications to help you relax. The operation is painless. Anesthesia is either local or general, depending on your age, medical condition and eye disease. You will not see the surgery while it is happening, and will not have to worry about keeping your eye open or closed. The eyelids are gently opened. Looking through a surgical microscope, the ophthalmologist measures the eye for the size for the corneal transplant. When the operation is over, the ophthalmologist will usually place a shield over your eye. If you are an outpatient, you may go home after a short stay in the recovery area. You should plan to have someone else drive you home. An examination at the doctor's office will be scheduled for the following day. Your ophthalmologist will decide when to remove the stitches, depending upon the health of the eye and rate of healing. * Usually, it will be several months, at least, before stitches are removed. What Can I Expect After Corneal Transplant Surgery? Cornea Transplants are done on an outpatient basis. The procedure itself takes 45 minutes to 75 minutes depending on the complexity of the situation. You should expect to spend the whole morning at the outpatient surgery center however. When you leave the hospital you will wear a patch and a shield. This will be removed the next day at your follow up visit at the doctor's office. After that you will be wearing dark glasses during the day and a protective shield at night only. Your vision will be blurry for approximately 3 - 6 months. At 3 months you will start having your sutures removed and they should all be removed by the end of 6 months a little longer if you are older. At the end of 6 months you will be fitted with glasses or contact lenses. During the whole 6-month period you will take anti -rejection drops and antibiotic drops approximately 4 times a day. For the first 6 weeks heavy exercise and lifting of heavy objects will be prohibited, but otherwise you can live a normal life. Most people return to work 3 to 7 days after their surgery depending on the type of work they do. Can I Get Rid Of Contacts Or Glasses After Transplant Surgery? Yes it is possible to be free of contact lenses or glasses after transplant surgery. This will however require additional procedures such as astigmatic keratotomy or LASIK. The fees for these procedures are not included in the cost of the original procedure and may not be covered by traditional insurance, though under certain circumstances they may be covered. After all the sutures are removed most patients are left with a certain amount of nearsightedness and astigmatism. This can be corrected either with Rigid contact lenses or glasses. If the astigmatism is large this can be corrected with astigmatic keratotomy to bring the patient to less than 4D of astigmatism. Patients with less than 4D of astigmatism and less than 8D of myopia can then have their vision corrected with LASIK. We have many patients who have successfully undergone these procedures and some of them would be happy to talk to you about their experiences. Who Is Best Qualified To Do A Cornea Transplant? Any of these symptoms should be reported to your ophthalmologist promptly. A corneal transplant can be repeated, usually with good results, but the overall rejection rates for repeated transplants are higher than for the first time around. Irregular curvature of the transplanted cornea (astigmatism) may slow the return of vision but can also be treated. Vision may continue to improve up to a year after surgery. Even if the surgery is successful, other eye conditions, such as macular degeneration (aging of the retina), glaucoma or diabetic damage may limit vision after surgery. Even with such problems, corneal transplantation may still be worthwhile. A successful corneal transplant requires care and attention on the part of both patient and physician. However, no other surgery has so much to offer when the cornea is deeply scarred or swollen. The vast majority of people who undergo corneal transplants are happy with their improved vision. Of course, corneal transplant surgery would not be possible without the hundreds of thousands of generous donors and their families who have donated corneal tissue so that others may see. If you are a candidate for a corneal transplant and would like to receive a more detailed booklet about corneal transplants please mail us a $20 donation made out to the Eye Defects Research Foundation with your return address. Click here to learn more about the Eye Defects Research Foundation and how you can support groundbreaking vision research. "I am an ophthalmologist with keratoconus and had the INTACS with Intralase procedure performed by Dr. Rabinowitz in October 2006. Speaking from the perspective of both a keratoconus patient and an eye doctor, I must say that I am truly impressed with the procedure. It was amazing- my astigmatism was reduced by 50% and my vision imporved by 3 lines on the vision test chart. This procedure allowed me to improve the quality of my work and my personal life. I always thought that I would need a cornea transplant some day, but this procedure has allowed me to defer the need for a transplant at this time. The procedure was fast, easy, and painless. I would do it again in a heartbeat without hesitation or reservation. As each patient is different, expectations are key to the success of this procedure. The purpose of the procedure is not to make your vision perfect, it is to improve the astigmatism and thus lessen distortion. You still will have keratoconus after INTACS, however you will hopefuklly have better vision with glasses, contact lenses, or both. I feel this procedure has given me a new lease on my future. Thank you Dr. Rabinowitz and staff for your expertise and excellent work!